Analysis: Murray has also visited the Lions and Seahawks since being released by the Titans last week. Kenyon Drake stepped in as the Dolphins starter after trading away Jay Ajayi and found some success down the stretch, but a move proven running back could benefit the team. The 30-year-old saw a reduced workload in 2017 with Derrick Henry taking over the Titans backfield, totaling 659 rushing yards and six touchdowns on 184 carries. Murray is visiting the Seahawks on Wednesday, Ian Rapoport of NFL Network reports. Analysis: Murray's search for a new home begins in Detroit after he was released by the Titans earlier in the week. The Lions struggled to find consistency in the backfield last season, ranking last in the league with 1,221 rushing yards. Both Ameer Abdullah and Theo Riddick remain under contract with the Lions for the 2018 season, so it remains to be seen how the Lions would juggle all three backs if Murray were to sign. The veteran back recorded 659 yards and six touchdowns on 184 carries in 2017. Analysis: In his second season with the Titans, Murray ran for 659 yards and six TDs on 184 carries in 2017. In the wake of his looming departure, Derrick Henry is poised to take over as Tennessee's lead running back. Murray, who turned 30 in February, will thus enter free agency as one of the top available options at his position and should have no problem landing a key role in another team's 2018 backfield. Murray, who suffered a knee injury Dec. 24, doesn't need surgery at this point, according to the Titans' official site. Murray (knee) has been ruled out for Saturday's divisional-round game at New England, Field Yates of ESPN reports. Analysis: According to Cameron Wolfe of ESPN.com, Murray missed back-to-back practices to start the week. Shortly after the second absence, the Titans made a definitive ruling on the veteran running back, who racked up 184 carries for 659 yards and six touchdowns to go with 39 receptions (on 47 targets) for 266 yards and another score in 15 games during the regular season. With Murray out of the picture this weekend, the Titans will roll with Derrick Henry as a three-down workhorse in the backfield. Murray (knee) was a non-participant at Tuesday's practice, Cameron Wolfe of ESPN.com reports. Titans head coach Mike Mularkey indicated that Murray (knee) is considered day-to-day heading into Saturday's divisional-round matchup with the Patriots, Cameron Wolfe of ESPN.com reports. "For [Murray] to miss anything, something's got to be hurt," Mularkey said Sunday. "I'm definitely not going to rule him out. He's day-to-day." Murray (knee) has been ruled out for Saturday's playoff game against the Chiefs, Jim Wyatt of the Titans' official site reports. Analysis: With Murray still sidelined, Derrick Henry will continue to lead the Titans backfield this weekend. In the team's regular-season finale, Henry logged a season-high 28 carries for 51 yards and added a 66-yard TD catch. Looking ahead, back-to-back missed games suggest that Murray would be no lock to play in the divisional round of the playoffs, should Tennessee triumph Saturday. The running back suffered an MCL injury during the Week 16 loss to the Rams. Murray (knee) didn't practice Wednesday, Cameron Wolfe of ESPN.com reports. Analysis: Murray was held out of practice for a second consecutive day as he continues to recover from the third-degree tear of his MCL, which he suffered in Week 16 against the Rams. Murray's status for Saturday's wild-card matchup against the Chiefs remains up in the air as his absence from practice continues, tentatively leaving Derrick Henry in line to serve as the primary option out of the Titans' backfield. Murray (knee) didn't practice Tuesday, Jason Wolf of The Tennessean reports. Murray (knee) has been ruled out for Sunday's game against the Jaguars, Jim Wyatt of the Titans' official site reports. Analysis: With Murray out Sunday, Derrick Henry is slated to handle the heavy lifting in the Jaguars' Week 17 backfield, with David Fluellen in reserve. The Titans may also elect to add further running back depth by promoting Khalfani Muhammad from the team's practice squad. 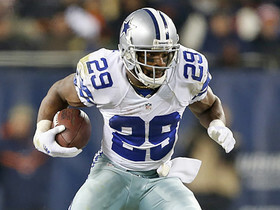 Murray (knee) remained sidelined at Thursday's practice, Cameron Wolfe of ESPN.com reports. 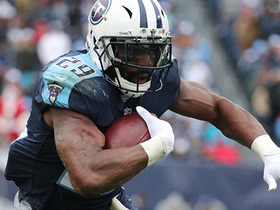 Murray (knee) did not practice Wednesday, Jim Wyatt of the Titans' official site reports. The Titans revealed that Murray (knee) has a third-degree MCL tear, though the running back is still optimistic he can play Sunday against the Jaguars, ESPN's Adam Schefter reports. Analysis: It isn't clear if this injury is in addition to Murray's LCL sprain that was first reported. Regardless, head coach Mike Mularkey stated Tuesday that Murray is considered day-to-day and the running back is still believed to have a chance at suiting up for Sunday's season finale. Titans head coach Mike Mularkey said Tuesday that Murray (knee) is day-to-day and noted the tailback hasn't been ruled out for Sunday's regular-season finale against the Jaguars, Jim Wyatt of the Titans' official site reports. Murray (knee) isn't expected to play Week 17 against the Jaguars, Ian Rapoport of NFL Network reports. An initial exam on Murray's knee revealed an LCL sprain, Adam Schefter of ESPN reports. 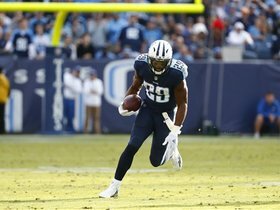 Analysis: Murray -- who suffered the injury in Sunday's loss to the Rams -- has an MRI on tap Monday to confirm the diagnosis, but at this stage it looks like he'll probably be out next weekend, which would set the stage for Derrick Henry to head the Titans' rushing attack in the team's regular-season finale against the Jaguars. 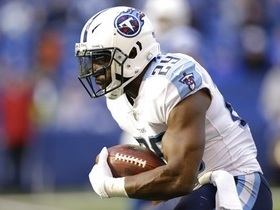 Murray, who logged 15 carries for 48 yards and a TD and caught three passes for 11 yards in Sunday's 27-23 loss to the Rams, has an MRI scheduled after suffering a knee injury in the contest, Jim Wyatt of the Titans' official site reports. Analysis: Coach Mike Mularkey indicated after the game that "it didn't look good" with regard to Murray's injury, so it looks like Derrick Henry could head the team's backfield in next weekend's regular-season finale against the Jaguars. Murray carried 18 times for 59 yards and caught one pass for an additional four yards in Sunday's 25-23 loss to the 49ers. Analysis: Murray tied his season high in carries against one of the worst run defenses in the NFL, but he responded with just 3.3 yards per carry and a long run of 11 yards. This poor performance was perhaps a microcosm of Murray's season, as he's received plenty of opportunities but has surpassed 59 rushing yards two times in 14 games. He'll go up against a beatable Rams run defense next week, but there's no guarantee that useful fantasy returns will follow. Titans head coach Mike Mularkey said that Murray's performance in Sunday's 12-7 loss to the Cardinals reinforced his status as the lead back ahead of Derrick Henry, Jason Wolf of The Tennessean reports. Murray carried 11 times for 34 yards and caught two of three targets for an additional 13 yards during Sunday's 12-7 loss to the Cardinals. Murray rushed 11 times for 66 yards and caught both of his targets for 13 more yards in Sunday's 24-13 win over Houston. Analysis: Murray's strong per-touch performance was overshadowed by a 75-yard Derrick Henry rushing touchdown to put this game away in the final minute. Each running back got 11 carries, but Murray's proficiency as a receiver out of the backfield continues to earn him a slight edge in overall touches. Both guys are worthy of lineup consideration every week, but each is struggling to maintain consistent value due to the other's presence. Murray was a full participant in Friday's practice and doesn't carry an injury designation heading into Sunday's game against the Texans. Murray (illness) was in attendance for the Titans' practice Friday, Jim Wyatt of the Titans' official site reports. Murray missed Thursday's practice with an illness, Jim Wyatt of the Titans' official site reports. Analysis: Murray should have enough time to recover from his illness in advance of Sunday's game against the Texans, though at this stage, he could end up being listed as questionable for the contest. A final word on his status heading into the weekend should be available following the Titans' practice Friday. Murray rushed 12 times for nine yards and a touchdown while catching three of four targets for 33 yards in Sunday's 20-16 win over the Colts. Analysis: Murray was outplayed by Derrick Henry (13 carries for 79 yards), but ended up having the stronger fantasy day. The veteran running back scored the go-ahead, one-yard touchdown with 5:59 left in the fourth quarter after his second-year counterpart did all the heavy lifting to put Tennessee in position to take the lead. Murray's four total touchdowns over the past three weeks have helped distract from the fact that he's managed only 61 rushing yards on 34 carries in that stretch. Murray rushed eight times for 10 yards and brought in five of six targets for 37 yards in Thursday's 40-17 loss to the Steelers. Murray (knee) rushed 14 times for 42 yards and two touchdowns while catching all four of his targets for 30 yards and another touchdown in Sunday's 24-20 win over the Bengals. Murray (knee) was a full participant at Wednesday's practice, Jason Wolf of The Tennessean reports. Analysis: Murray received treatment on his knee during Sunday's 23-20 win over the Ravens, and while he only had 41 yards on 11 touches, he managed to log 71 percent of the offensive snaps. The injury doesn't seem like a threat to his availability for Sunday's game against Cincinnati, but it does add to the list of nagging issues that have limited Murray's effectiveness this season. He'll continue to share work with Derrick Henry, who received double-digit touches in each of Tennessee's last three games. Murray's practice reps will be impacted by a knee injury this week, Terry McCormick of TitanInsider.com reports. Murray (shoulder) rushed nine times for 19 yards while catching both his targets for 22 more in Sunday's 23-20 win over the Ravens. Analysis: Murray exited briefly in the second quarter after hurting his knee, during which time Derrick Henry converted a one-yard touchdown. Henry rushed for seven more yards than Murray on his eight carries, as the pair appear to be trending toward more of an even timeshare. The 29-year-old veteran is the more explosive of the two backs, but it's tough to depend on Murray for a full starter's workload given his frailty. 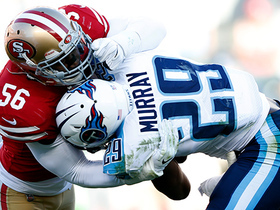 Murray (shoulder) practiced fully Wednesday, Jim Wyatt of the Titans' official site reports. Analysis: Murray was afforded some added healing time during last week's bye and is good to go for Sunday's game against the Ravens. While Baltimore held the Dolphins run game in check in Week 8, overall, the Ravens have allowed an average of 132.8 rushing yards per game to date. 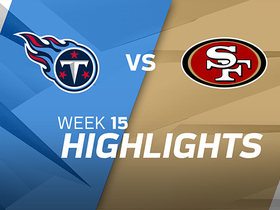 Murray figures to continue to head the Titans' ground attack in Week 9, though Derrick Henry is also firmly in the mix and will look to bounce back from a sub-par effort (13 carries for 13 yards) in Week 7. 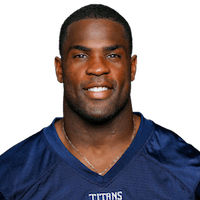 NFL Network Insider Ian Rapoport brings the latest information on free agent running back DeMarco Murray visiting with the Seahawks. 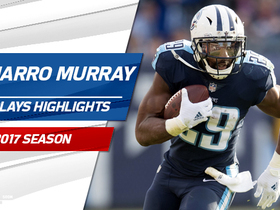 Check out running back DeMarco Murray's top plays from the 2017 NFL Season as a member of the Tennessee Titans. 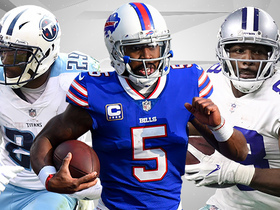 NFL Network Insider Ian Rapoport gives an update on the what the future may hold for Dez Bryant, Tyrod Taylor, DeMarco Murray and more. 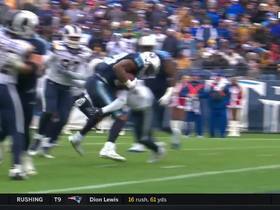 NFL Network's Aditi Kinkhabwala has the latest on Titans running back DeMarco Murray's status and how Marcus Mariota has looked in practice this week. NFL Network Insider Ian Rapoport talks about the injury to Titans running back DeMarco Murray and the likelihood he will play in Week 17. San Francisco 49ers linebacker Reuben Foster halts DeMarco Murray at line of scrimmage, walks off with apparent hand injury.